AnimationMaker is a software designed to help you to quickly build presentation video which you can upload to youtube or vimeo. These presentation videos can be used as pitch videos for crowdfunding campains for example. It is also possible to create animated gifs and HTML animations. The idea for the AnimationMaker comes from Adobe Edge which is not available anymore. 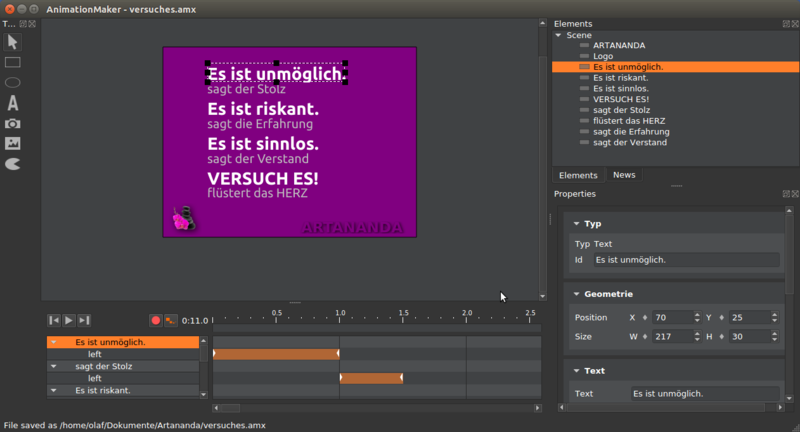 AnimationMaker is a software to create animated presentations and export them to a movie, animated GIF, XML file or even a HTML animation. Animations build with AnimationMaker can be exported to a couple of movie formats supported by ffmpeg like mpg, mp4, avi. 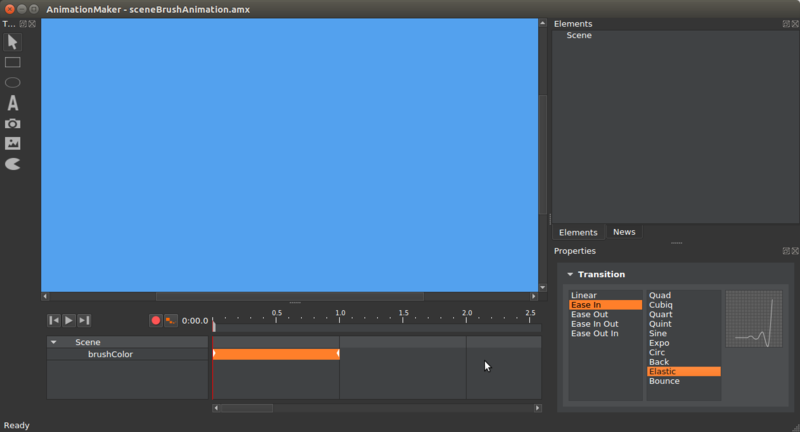 Animations build with AnimationMaker can also be exported to an animated gif. Animations can also be exported to SVG which can be embedded into a HTML page and animated using GSAP. Here are sample preview pictures of the AnimationMaker in action. 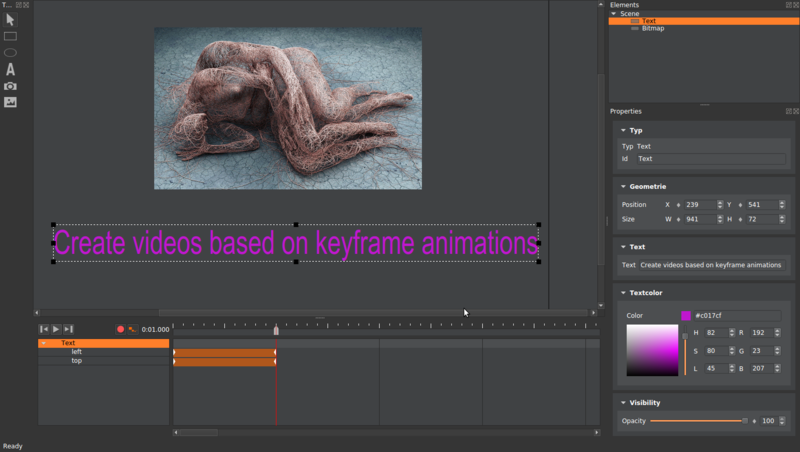 I have created a small intro video so that you are able to see how the AnimationMaker works. The animation is based on FFMPEG. This animation is based on the above animation (same code base). 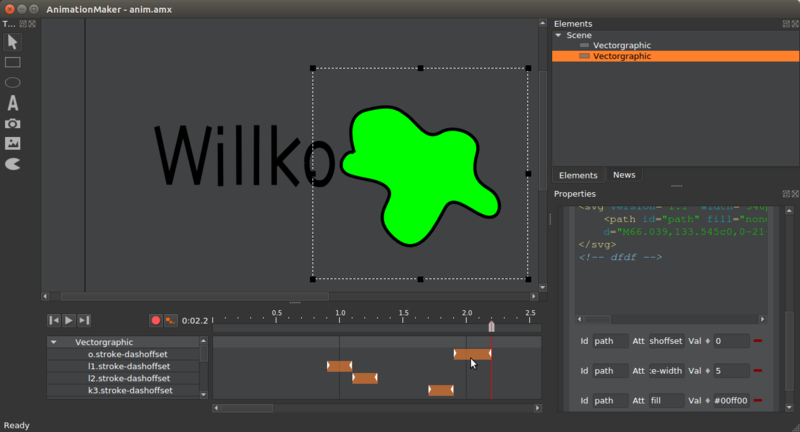 The animation is based on SVG and GSAP. Here you can download our latest release for Linux for free. Do you want to know more about AnimationMaker or do you have feature requests don't hesitate to contact us. This website has been builded using the following tools.